Netanyahu, former defense minister Ehud Barak discuss 'Sabena rescue' and why similar mission wasn't carried out for Gilad Shalit. Prime Minister Binyamin Netanyahu was interviewed by Galei Israel on Thursday morning along with former prime minister and defense minister Ehud Barak about the new Israeli film "Sabena." The film recreates the May 9, 1972 hijacking by four Black September terrorists of Sabena Flight 571, a passenger flight arriving from Vienna to Lod Airport with 90 passengers on board, and the ensuing heroic rescue mission by Israeli commandos. A team of 16 Sayeret Matkal commandos were dispatched under the guise of airplane technicians, led by Barak and including Netanyahu. 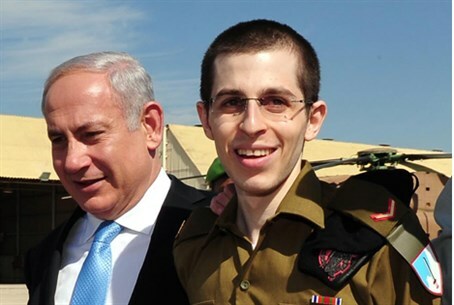 After recounting the daring rescue, Netanyahu and Barak were asked why Gilad Shalit - who was captured by Hamas in 2006 and released in a prisoner swap deal in 2011 - was not freed in a similar operation during their respective tenures as prime minister and defense minister between 2009 and 2011. Barak answered that "if there had been a point in time when there was sufficient information, a reasonable plan of action would have been prepared and an operation carried out. But there was no such thing." "There's a difference between changing direction on the head of a certain boy when the whole country knows his name. I thought we should uphold the deal, but immediately after adopt the British or American standard [regarding prisoner swaps]." Netanyahu was then asked how he felt during the campaign for the 1999 elections, when a poster of Barak on the wing of the Sabena plane was published. "It was a lot less painful than the bullet in my arm, and we got through both of those things," Netanyahu said. "We moved forward. We cooperated together for the security of Israel and its continued existence when I was prime minister and Ehud was defense minister." Interviewer Yaron Dekel asked Netanyahu if he would like to cooperate (politically) again with Barak, wherein Barak exploded, noting that Dekel "had agreed not to talk about politics." "We'll leave politics to the side today," Netanyahu intervened, "but I very much appreciate the joint work we have done and there is much more work to do."